"You can do it from the comfort of your own home!" ...Sounds like a smarmy infomercial pitch, right? But when I say it, it's true: For the past 5+ years, I've been showing Amazon/eBay sellers like you how to (honestly) source products online and make a real income. I'm giving you more tips and info on a terrific training system today. You can skip all this and just get this proven 'ABCs of Online Sourcing'* by mega-seller (and mom and wife) Jessica Larrew. This course shows you everything you need to know to get a consistent and reliable steady stream of resellable, profitable products to your door. 1.) FREE: Download or view this new infographic (or try this link) that I created for you. 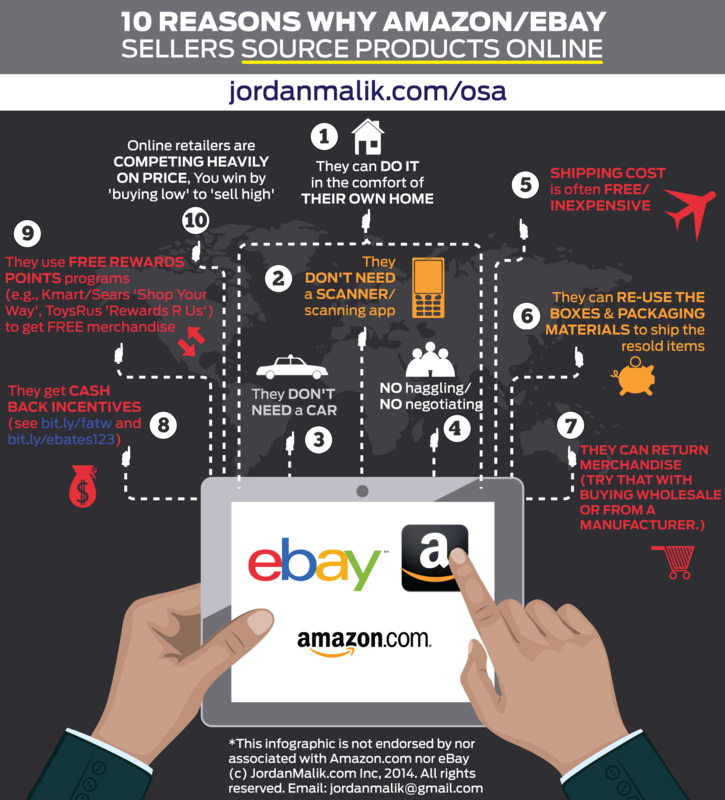 It explains why sourcing products online is so awesome. 2.) $47 (but worth $250+): ABCs of Online Sourcing where you can learn from Jessica, who relies on online sourcing for a steady inventory stream. *This course is not for raw beginners! 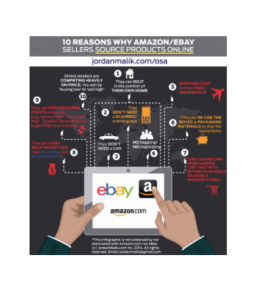 You should be in the U.S. and have some experience selling on Amazon (if you don't, see the free and not-free 'Amazon Seller Help' sections on my resource page.) Let me know if you have any questions. I just wanted to add that I purchased the boot camp in hopes to get the online source course too, but it’s not free, there’s an additional cost for it. Just wanted to point that out, before someone else purchases it and think its included. It’s a good marketing strategy to break out so many parts, and charge for different sections, but I find myself paying for stuff I already read online for free & it’s very frustrating because I don’t feel comfortable requesting refunds for info they are giving me, but the boot camp is slanted more towards a true beginner. I didn’t realize that wasn’t me though ?. I needed the other course, I’m assuming. Thanks, but note my article (dated March 2015) says if someone had previously purchased the Boot Camp, then the Online Course was free for those members. I highly recommend that you request a refund if you’re not happy in any way (it’s no questions asked). Yes the boot camp is slanted toward a true beginner. If you have trouble getting a refun let me know. I am on the fence. I have been selling for a little while now and do mostly retail arbitrage and thrift shops. Working a lot at my day job lately and so don’t have much time to source and am going to turn to online arbitrage. You have reviewed Chris Green’s book and now you have seen Jessica’s. I am only going to go with one, which would you choose? Hi, is the money-back guarantee still going on? So is the money-back guarantee still going on? Yes, the money back guarantee is current. Thanks for the fast reply, Jordan! 1.Which is better the how to used books by Skip McGrath or the one by Adam Bertram? 2.I’d like to make about $450 a week profit within 1 month with a capital of $1250. Is this doable using the how to books you’re selling on your sites? Which how to lesson is faster to achieve this goal: would it be Jessica Larrew and Matt Carlett’s Online Sourcing or Skip McGrath How to Sell Used Books on Amazon? 3. Do you recommend to start with selling used books on Amazon first before selling anything else? Does selling used books require the least capital to start with? Because that is what I want: least capital married with fastest profit! 4. If there is one fastest way on how to make money online and if you could choose only one from many on your sites . which one would you pick? Hi Kenny, looks like you need some personalized help, which is best delivered to you via a phone conversation. Feel free to schedule a one-on-one call with me here. I did some reading online about selling used books/CDs/DVDs on Amazon FBA. Many say that it is easy to find these items locally and that used books are everywhere, but the difficult part is to find those that would sell profitably on Amazon. Please shed a light on this, because this saying has dimmed my enthusiasm to be a used book seller on Amazon FBA. There is PLENTY of opportunity in used books, CDs, and DVDs. The only challenge (and it’s a minor one) is that for every 7 to 10 books/CDs/DVDs you scan, only 1 or 2 are worth buying and selling for a very good profit. I still scan used books/CDs and DVDs today. It’s garage sale/estate sale/yard sale season so be sure you’re saturating that, and for advanced techniques (many your competing sellers haven’t even thought of) are in this highly-recommended e-book. Good luck and DON’T give up! This was a timely communication as I just made my first online purchase. I found an item that has an Amazon rank of under 5,000 and is #3 in the sub category. It is currently being sold by Amazon. There are no other FBA sellers and 11 offers. My cost (with free shipping) is less than 50% of the Amazon selling price. I purchased 30 units. The order is due the first part of next week. Once received it will be part of my first shipment to Amazon as a newbie. I will list it for FBA sale at the same price as Amazon as I do not want to compete with them. I enjoy your podcasts and have learned much from your materials. Sounds like you got a great deal, Mike. Thanks for sharing!